Cinco de Mayo is just under two weeks away, and I’m already plotting out the festivities. Agave drinks (margaritas especially) are a must on May 5. I’ve got plenty of margarita recipes in the archives, but I thought I’d share something a small new this year. 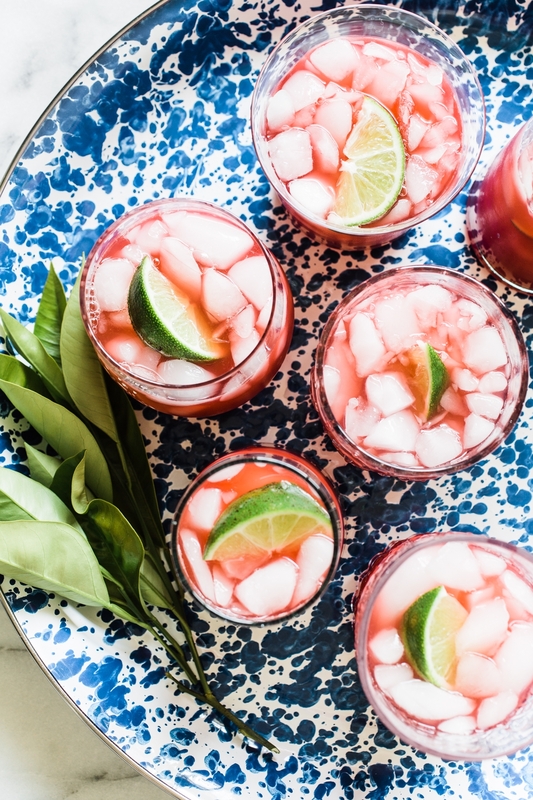 Hued a vibrant shade of pink-red, these Smoky Blood Orange Margaritas pack quite the boozy citrus punch. To make one, shake up some silver tequila with blood orange juice, lime juice, orange liqueur, simple syrup and the secret ingredient, mezcal. Just a 1/2 ounce of this smoked agave spirit adds plenty of smoldering intrigue to the drink. Garnish simply with a lime wedge. 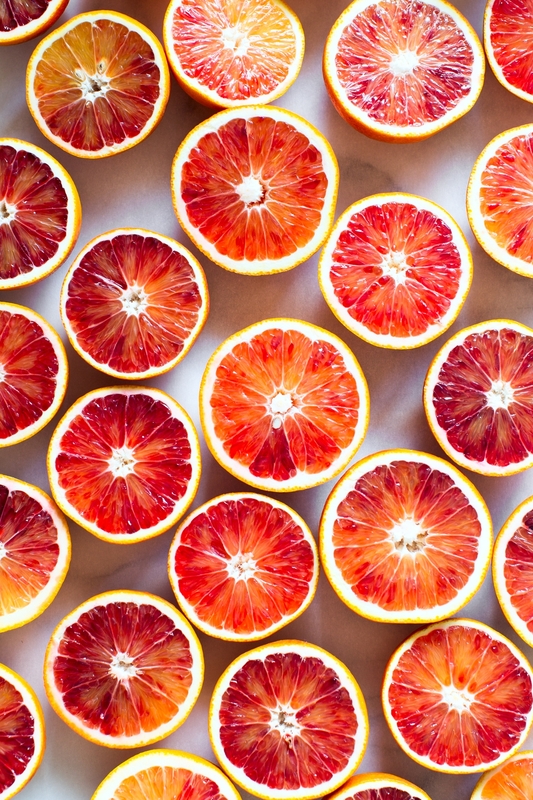 Blood oranges are in season right now, so be sure to pick some up at the market while you still can! Continue reading for the recipe. The recipe below is for just one cocktail, but you can certainly scale things up to make drinks for a crowd. 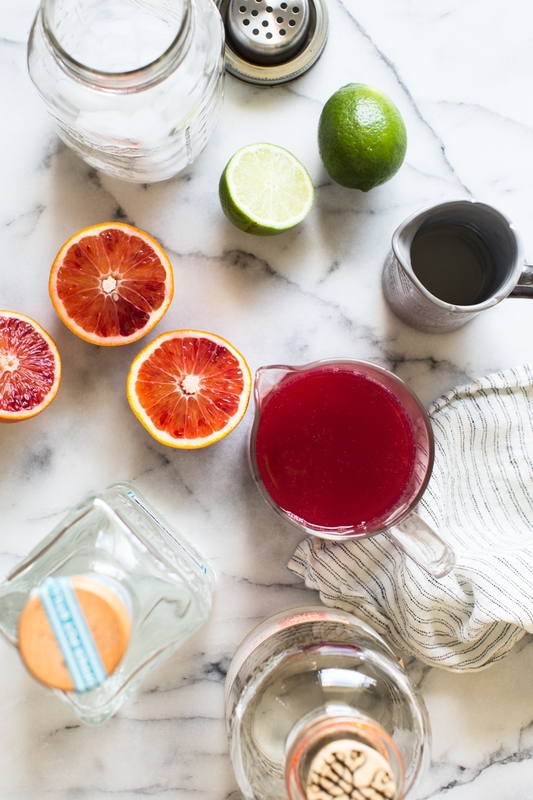 You’ll want to juice the blood oranges and limes the day of the party (or at most, the night before). Citrus juice loses some of its sparkle if you squeeze it too far in advance. Right before the party, mix all of the ingredients in a huge pitcher or beverage dispenser, and do one final taste. Add more lime juice or simple syrup if needed. If you can’t find blood oranges, you can certainly use regular oranges here. The color and flavor will be a small different. Add tequila, mezcal, blood orange juice, lime juice, simple syrup and orange liqueur to a cocktail shaker filled with ice. Cap and shake until well chilled. Strain into a rocks glass filled with ice*. Garnish with a lime wedge. * You can salt the rim of the glass if you’d like. Be the first to comment on "Smoky Blood Orange Margarita Recipe"